You are currently browsing the archive for the Classics category. 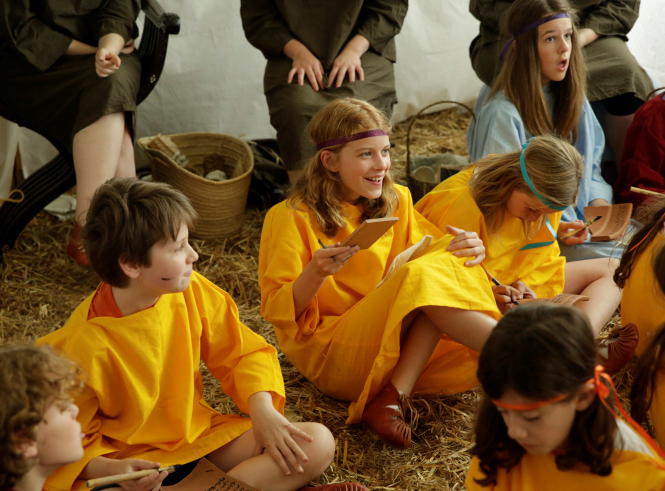 Children have been getting to grips with reed pens, papyrus and wax tablets in an immersive ancient schoolroom experience conceived by Eleanor Dickey, Professor of Classics. Here she tells us about the project – and what we can learn from the teaching practices of antiquity. What did ancient children actually do in school? How did they act? Did they all arrive at the same time, listen to lectures from the teacher, and raise their hands when they wanted to speak, as schoolchildren often do today? Until recently, the murky evidence we had suggested that ancient schools were probably not like modern ones – without making it very clear how ancient education worked in practice. So I was excited to discover, while studying an ancient Latin textbook, a set of detailed descriptions of a child’s day at school. The University of Reading’s Collections are an outstanding resource, from the Beckett Collection through to the Museum of English Rural Life. Research using Collections is taking place right across the Institution, and has been for a number of years. 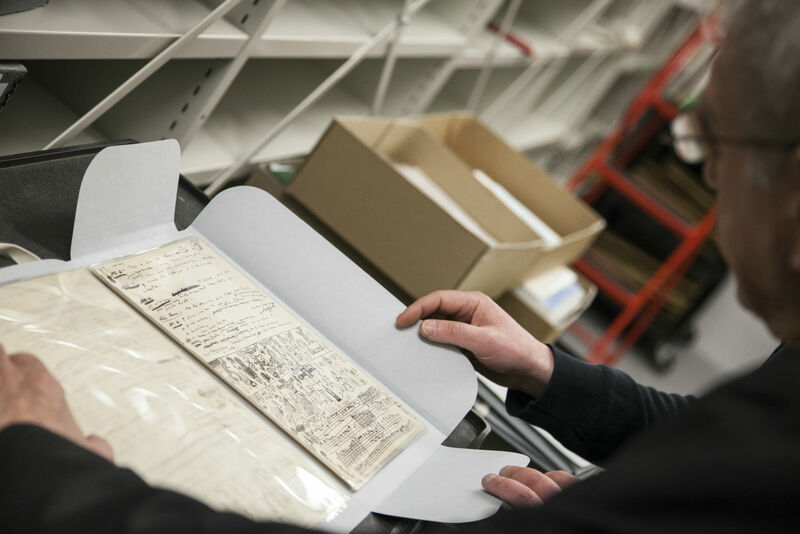 Examples include investigations into the Hugh Sinclair Archive by Food and Nutritional Sciences, Architecture’s use of the DWG Collection and use of the WH Smith Archive by the Henley Business School. However, given the breadth and quality of this resource we could be making much greater use of the Collections for grant-winning research. Can we mend broken hearts? Professor Peter Kruschwitz is Professor of Classics at Reading and a specialist in Latin Language and Literature. eripuit iuuenem, ferreus ille fuit. uiuere et erepta coniuge qui potuit. ingenio: frangit fortia corda dolor. The image of heartbrokenness – ancient, yet familiar – begins to intrigue: how can a heart be broken, how can it get broken? Is it just the lack of resilience to emotional strain, one’s weakness, as Lygdamus suggests? Plautus exploits the imagery of a ship exposed to the heavy sea, battered by the waves, lacking direction, and ultimately crushed to pieces by the forces of nature to describe the battles, external and internal, that Alcesimarchus has to face in his quest for fulfilled love. From here it is only a small step to the image’s predominant use outside the realm of Latin poetry: here, animum frangere is frequently used particularly as an image denoting the ‘crushing of someone’s spirit’ (rather than heart itself – the Latin term covers both facets). Even this very small selection of Latin usages of the image of the broken heart does show: pain, worries, sorrow (and ultimately: death) are deeply connected to it – and the idea of suffering and even of death due to a broken heart (figuratively, not literally speaking) is not alien to the medical profession. What is interesting to a linguistic scholar, of course, is how a verbal image that started its life as a poetic metaphor can be appropriated by the language of science – a language that often (albeit incorrectly) is deemed objective and descriptive. The image of the broken heart that Dr Boateng uses in his big question is by no means an exception in that respect. Instead, it even adds another facet to it: the allusion to the image does not restore a literal facet of the phrase ‘broken heart’ that did not exist in its figurative use – hearts, unless subject to substantial physical force, do not literally break into pieces, like a clay vessel if dropped. Instead, it combines the pre-existing image with that of a broken piece of machinery (an engine, perhaps), thus expanding the metaphoric use rather than restricting it. Dr Boateng asks a big question: ‘Can we mend broken hearts?’ – and I very much hope he can (or that he will be able to do that one day in the very near future). An even bigger question than this could be: ‘Should we mend broken hearts?’ One must not be cynical when it comes to deeply unsettling matters; yet, the answer to this question, whether for the scientific or the poetic use of the phrase, will have to remain a philosophical one. Why exactly is this on display in Reading’s Broad Street? Older residents of Reading may remember that the building was not always that of HSBC, but was once the location of the Midland Bank. This bank was acquired by HSBC in 1992, and it was rebranded in 1999. 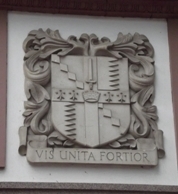 The crest, with its freemasonic elements, and the Latin motto was that of the Midland Bank, originally founded in 1836. It is beautifully ironic in a way that the Latin inscription and the crest alone survive, with a Latin motto that in hindsight seems to suggest that, even for banks, only joining forces is hope for survival. After just twenty years, it has become difficult to understand the relationship between the Midland Bank motto and its current location. It may also be difficult or in fact impossible for many passers-by to grasp the meaning of the text, even though Latin mottos are, in fact, still frequent in Britain. 8 Februarii, anno D(omi)ni 1686, aetatis 23. 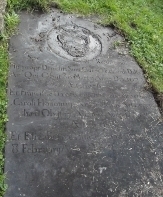 The stone, embellished with a significant coat of arms at its top, now exposed to weather, filth, and vegetation, records the life of one of Reading’s foremost dignitaries at the time as well as those of his family: Edward Dalby of the Inner Temple. Henry Hyde, Earl of Clarendon, described him as a man ‘of eminent loyalty and as wise a man as I have known of his rank’. He married Frances, daughter of Charles Holloway, also a lawyer. Dalby became Recorder (or High Steward) of Reading in 1669, replacing Daniel Blagrave, who had to flee the country for his involvement in regicide (as one of the signatories of King Charles I’s death warrant). Their daughter died young. Their son John, not mentioned in this text, continued the legacy of the Dalby family after his father’s death. Only a small street, Dalby Close in Hurst, Wokingham, still preserves the family’s name today. A small step towards regaining collective memory? There are well over 100 Latin inscriptions, from ancient to modern, in Reading – some of them well-known to everyone (like the one on the pedestal of the statue of Queen Victoria on Blagrave Street), others rather more cryptic and hidden away. Many of them have fascinating stories to tell, and they all add to the jigsaw puzzle that is the history of Reading. For the Latinist, they are also invaluable documents to understand the spread, role, and legacy of Latin in modern times. It is high time to collect these texts and to make them available to the public, in translation and with appropriate amounts of documentation, so that fading memory, in conjunction with a language barrier, will not soon turn into complete and utter oblivion. Dr Matthew Nicholls from the Department of Classics at the University of Reading is interested in the political and social history of the Romans and the way that the built environments of Rome and cities around the empire expressed their values and priorities. Matthew has an interest in computer modelling as a way of exploring ancient structures and bringing them to life and has developed an ambitious recreation of the city of Rome in the age of Constantine. The first Roman emperor Augustus (ruled 31BC – AD14) began the imperial tradition of offering the people of Rome the ‘bread and circuses’ – cheap food and entertainment on a lavish scale – that came to characterise life in the city. Augustus, as one ancient commentator tells us, “surpassed all his predecessors in the number, variety and splendour of his games”, often using new or restored buildings within the city as a setting and boasting (not without justification) that he had “found Rome a city of brick, and left it a city of marble”, a tangible element of his vision for cultural, political and moral renewal of the Roman state. After more than a decade in power Augustus used this renewed city as the setting for a particularly splendid set of games, which combined high literary culture and deliberately archaising religious ceremonial with popular gestures, including the provision of plays and chariot races. These games were intended to celebrate a renewed epoch of Roman prosperity and divine favour, a saeculum, and are therefore known in English (despite their religious function) as the Secular Games of 17BC. We know about these games from a variety of sources – ancient authors mention them, the special hymn that the poet Horace wrote at the emperor’s behest survives, and several of the buildings or areas used for the events are known to archaeologists. We also have an inscription, found in fragments, that had been reset into a medieval wall, which lays out the daily programme for the games as devised by the priestly board in charge with details of the venue, date, and time for each event. Combining the text of this inscription with what we know about Augustus’ building programme in Rome lets us see how he used his regenerated city as a backdrop for these games, reinforcing the message of renewal and prosperity with a splendid vista of new and restored buildings. In particular, the daily programme of supplementary entertainments, put on as crowd-pleasers for a week after the main religious sacrifices had been concluded, led crowds of spectators in their tens of thousands from open ground on the edge of town past a series of buildings – temples, porticoes, theatres, squares, and parkland – that had received special attention in the previous decade, showing off a thoroughly regenerated quarter of the city. The modern Olympic Games, with their simultaneous functions as national showcases, catalysts for urban regeneration, and cultural spectaculars, offer a good comparison. Moreover, the detailed timetable set out in the inscription allows us to investigate how the Games’ planners took particular advantage of the summer sun. The Games were held in early June, with events starting (as was common in the ancient world) shortly after sunrise. 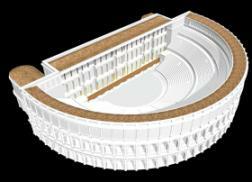 By the time that spectators arrived at the morning’s final venue, Augustus’ own new Theatre of Marcellus, it would have been around a quarter past eight in the morning on a modern clock. The Theatre of Marcellus is, uniquely for theatre buildings in Rome, orientated so the stage points north east; the other venues for the Games point west. With help from a UROP undergraduate research assistant, Ed Howkins, I used the digital model of ancient Rome that I have been building as a research and teaching tool to investigate the lighting conditions in the Theatre of Marcellus at the relevant date and time. It turns out that the stage would have been perfectly illuminated for exactly the period in which the plays were held there, with the sun shining on the actors rather than into the faces of the spectators. It seems that Augustus’ theatre architects had created a venue intended especially for morning performances, and that his games planners responded to this by ensuring that each day’s entertainment culminated in the splendid new theatre at just the point when it was most perfectly illuminated – a subtle reminder that the reign of Augustus and the continued prosperity of Rome were, as the prayers for the Games implied, cosmically ordained and favoured by heaven.